For security reasons, SendinBlue has updated the procedure for adding senders to users’ White Label sub-accounts. From now on, when one of your sub-accounts wants to add a new sender, its domain must be included in your parent account’s verified senders list. The steps below explain how your sub-account users can add a new sender. Review the sender that your sub-account wants to add and verify the consistency of this with their activity. Once you know your sub-account’s sender, you need to identify its domain. To do this, nothing could be simpler: anything that comes after "@" is part of the domain name that needs to be added. Example: your sub-account wants to add the sender "newsletter@hellomydomain.com". The domain to be added to your list of verified domains is hence "hellomydomain.com". Note: You won’t be able to authorize a non professional domain (e.g. @gmail, @yahoo, @outlook) as your sub-accounts don't own this type of domain. From your parent account, click on "Senders and IP" (1) in the top right hand menu or in the left-hand menu (2) if you are already in "My account". Then click on the "Domains" tab (3). 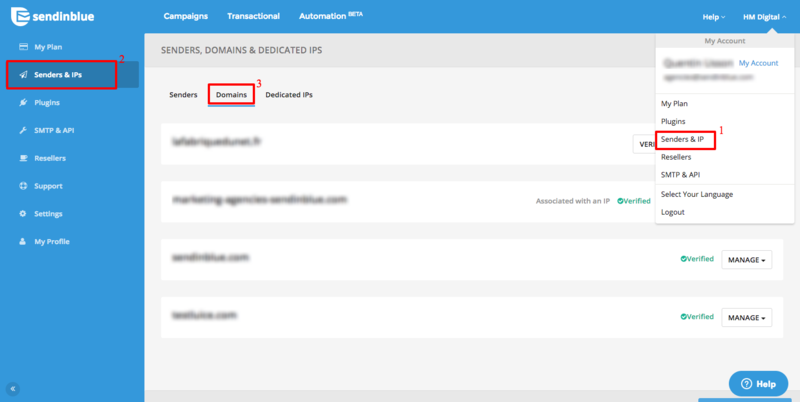 Click on "Add a domain", and in the pop-up window that appears enter the domain name that you have identified for the sender of your sub-account and click on save. Note: Do not check the "I would like to use this domain name to digitally sign my emails (SPF, DKIM, DMARC)" box. You will now be able to see the sender's domain for your sub-account in your domains list together with the status "Verified". And that's all you need to do. 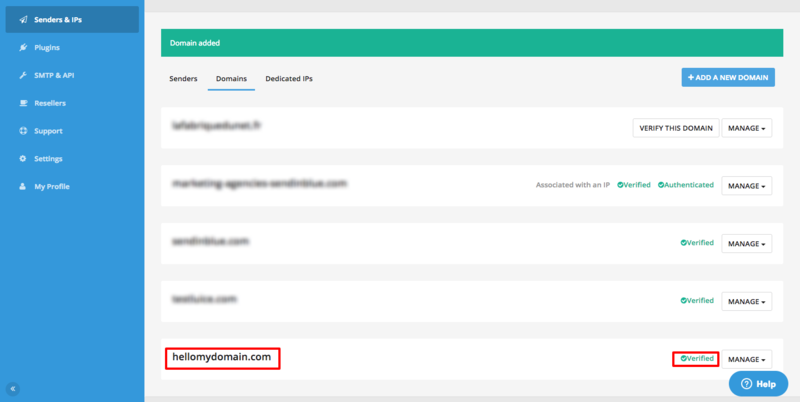 Now your sub-account will be able to add any sender with this domain name (@hellomydomain.com) without your intervention and directly from their interface.